How much fluff can there be in one person’s head? I now know the answer….. A full bag. 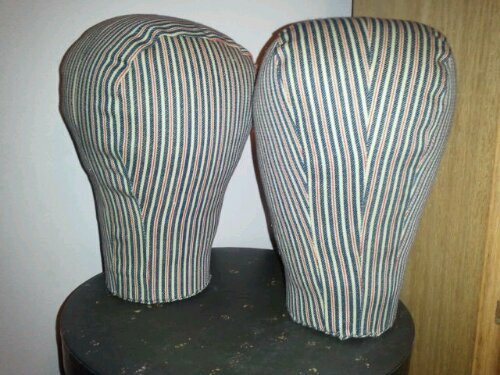 Tonight, I made a pair of red and blue striped heads to hold my bonnets. The pattern I used by Lynn McMasters (here) was easy to follow. I used a heavier canvas weight fabric I picked up at Bits & Pieces. Good choice. Inside each is a full back of poly-fill. Really. The base is a thick piece of wood my tech friends cut for me. A few numbers to add – Just under 1 yard of 44″ fabric made 3 heads. I only paid $.60 at Bits & Pieces. Regularly, figure $5-8 with a Joann’s coupon. The wood was cut for me at no cost. The fiber-fill I also had on hand. I think it was $4.99 a bag. If bought from scratch with one of Joann’s sales and coupons, 3 heads would cost about $12.50 to $23. Not bad. I love them! I have one polystyrene head that I despise, yours are way nicer. These were so easy. Make some. I had just under a yard of 44″ wide fabric. That was enough for 3 heads. I am loving your fabric head forms!! I will have to think about making some for my hats to perch upon! Thank you!! What a great idea! I’m off to Joanns today for thread – and you know that’s never the only thing you buy! – I’ll be looking for some fabric to make a couple of these. I had to use my modern ‘head’ for the Sutter’s Fort Trader’s Fair last year to display slat bonnets and it looked so, so, so Modern! These will be much better!